Vancouver – Concord Pacific Quayside. Read The Battle for the World’s Skyline here. Sean Hodgins, the head of Century Group, is undertaking a public process on the future of the “Southlands” in Tsawwassen (the old Spetifore lands) – including a recent charrette with Andres Duany, the New Urbanist architect who also conducted a similar exercise for the East Fraser Lands last year. New Urbanism, often wrongly dismissed as a stylistic response to urban planning, does derive inspiration from architectural tradition, since (at least before Modernism) it usually responds to the regional climate and locally available building materials. We had long discussions and drives around South Delta and in fact around much of Greater Vancouver trying to identify a proper architectural style (my instructions were ‘anything but Arts and Crafts’ which seems a bit too catch-all). When Duany was first here in January as part of this discovery process we were driving around Boundary Bay and he said, ‘That’s a Swedish house. Look at its simplicity. And the climate is the same. There’s your architectural style right there’. In fact he had nailed it better than I thought at the time. There is an even stronger Scandanavian (Norwegian) influence in Point Roberts and the whole Scanadavian style really has solid roots here. Anyway, I found out just two weeks ago from a long-time resident in Boundary Bay that in fact the house that he liked so much and that he had identified as Swedish was actually a kit home that someone had shipped from Sweden many years ago. Michael Pollan, author of The Omnivore’s Dilemma, wrote the best seven words to open an article on nutrition that I have ever read. Here. Now he has written the best two words to open an article for Earth Day. Here. This bit of pavement doesn’t rank as “New Stuff” quite yet: it’s the southern end of the Carrall Street Greenway (design here) – a critical link between the False Creek seawall and, eventually, Burrard Inlet and Coal Harbour, completing the loop around the Downtown Peninsula. Eventually, thousands will be biking, blading and walking on this connecting link every day, joining up Gastown, the Downtown East Side, Chinatown and Concord Pacific Place. Now, if you look carefully (and I have), you’ll notice something very odd: there’s no bike rack. Regardless of the traffic flowing by on the seawall and already using the greenway, Concord has made no accommodation for cyclists at all. In fact, the whole lay-out of the Presentation Centre site has been designed purely for drive-in traffic. There’s no pedestrian entrance on the seawall, and even the berm that surrounds the site on the north side avoids providing a pathway for bikes and peds directly to the entrance. The assumption: if you didn’t drive to get there, you don’t count. Now here’s what I find odd. Not that they designed the site only for cars, not that they have don’t have a bike rack, not that they’re ignoring the traffic on the seawall. What I find incomprehensible is that they failed to take advantage of one of the best marketing opportunities available today – one that they paid millions for, and that they could lever to make millions more. It was Concord, after all, that paid for the seawall on the North Shore of False Creek; it is Pacific Place that pioneered a more pedestrain-friendly urban design. Concord already has the brand! And Concord, apparently, is oblivious. Forget ‘good intentions’ or even the city’s bylaws that require bike racks. To not take advantage of what you’ve already paid for, to fail to market your legitimately green credentials, to ignore your potential customers walking and cycling by, is leaving money on the table. That’s what the absense of a bike rack really means. Down to Seattle last weekend: dismal weather, but an opportunity to see some of the city’s newest development. It’s a good news/bad news story. The new light rail line connecting Downtown with the Airport is nearing completion. At least there’s enough on the ground to get a sense of what’s coming – and “on the ground” is the operative phrase. But remarkably, not only is the rail in place but so is the residential redevelopment – built and occupied before the service even starts. These mixed-use projects look nicely scaled to my eyes, even on a gloomy day, and I presume they incorporate a percentage of affordable housing. Most unusual to see transit-oriented development occur on this scale before the line is even open. Not so good is the new townhousing popping up in Seattle neighbourhoods as the city tries to find ways to provide appropriately scaled densification. The idea is good; the execution isn’t. At least I think it’s the front. You can see the garage door and driveway tucked in below the main floor – and hence the problem. Because there is no underground parking (no doubt at considerable savings), the house does not address the street in a traditional way. But worse is the cramped massing on the site, made even more problematic by the wooden fencing, cheap in appearance and doomed to age badly, that may give privacy but only at that expense of neighbourhood civility. It’s a mystery to me why the parking is not accessed from the back. While this lane may be eventually paved, this is not a route anyone is going to want to use, particularly at night. Just waiting for the taggers. Altogether, a very unhappy illustration of how ground-oriented housing can be fitted into existing neighbourhoods. Design and parking aren’t the only big differences, of course. The differential in cost between the Seattle and Vancouver examples, I suspect, is huge – and hence the dilemma of affordability. Yes, it’s a bridge. But since passage is limited to those on foot and paw, I prefer the French term – passerelle. Though they have a long history (the Pont des Arts of 1804, for instance), they are among the most interesting blends of architecture and engineering to be found these days. The idea behind this one: to evoke the image of a sea-going kayak, including the straps across the deck. 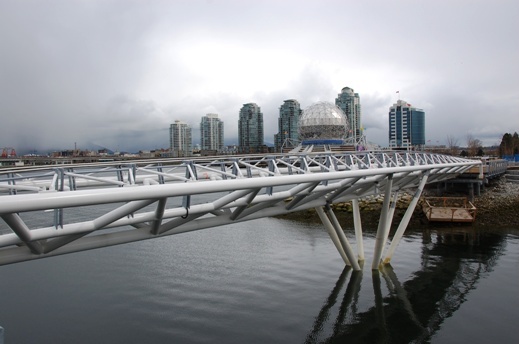 Now the obvious question: why is there not a passerelle across False Creek? The need is obvious. A low-level bridge that connects both banks would be an elegant solution to the Burrard Bridge problem. The cost alone – now $50 million – to widen the structure over the objections of the heritage community justifies a look at other options. The problem, apparently, is that a low-level bridge would block the passage of sailboats. But perhaps it’s time to ask the question: why should we sacrifice a solution that could serve thousands of people every day, support sustainable transportation, add a landmark to the city and save a lot of money to instead serve a few recreational craft that might, with adjustable masts, still be able to navigate the creek? The peripatetic Charles Montgomery visits Portland. Back again – and working on Paris for upcoming Price Tags. In the meantime, went to hear Copenhagen architect Jan Gehl in Richmond (Stephen Rees does a nice summary here). And was surprised at the impact of the Canada Line guideway down No.3 Road. Now I understand why Richmond Council wanted an at-grade right-of-way – even if it wasn’t feasible. Granted, I saw the line at night – a dark and looming mass that stretched into inifinity. Lighting will no doubt help, as could some clever art. Staff are working on it – and I hope they have a budget equal to the challenge. Though I confess, the meaning of this escapes me. Does Gordon Campbell know about this? As James Kunstler would observe (see below), you can tell a lot about a civilization by the quality of the “public realm” – the spaces jointly shared by every citizen. As opposed to the privileges of “the consumer,” who has no repsonsibilities for the commonwealth except, of course, to consume it. These steps, gracefully proportioned and substantially built (with a glass balustrade! ), do nothing more than connect the pedestrian right-of-way between the hard-edged Yaletown Park at Nelson Street and an allee that runs through the complex of towers to the north and joins up with Smithe Street. In fact, these steps may not even be on public land. Chances are, they’re owned and maintained by strata corporation, with a convenant allowing for continual public access. The point is: this is public, it is well done, and it says, as Kunstler would commend, that this is a place worth caring about.